The easy way up, but still difficult. Park in Cronins Yard V83665 87340 A where there is pay parking (2€ per day) and room for 50 cars. There is also a seasonal Tea room and toilets.Walk through the gate passing a wall of plaques to your left , follow the track through another gate and over a stream. The path becomes loose pebbles, turn left just before the first bridge crossing to a stile at V83070 86411 B. Follow the stream edge from here before turning off to the left aiming for a noticable line of rocks that descend from Lough Cummeenapeasta. Follow this line up to the Lough. Ascend eastwards over large rocks, it is easier to use these to step on rather than picking your way around them on the scant loose soil. 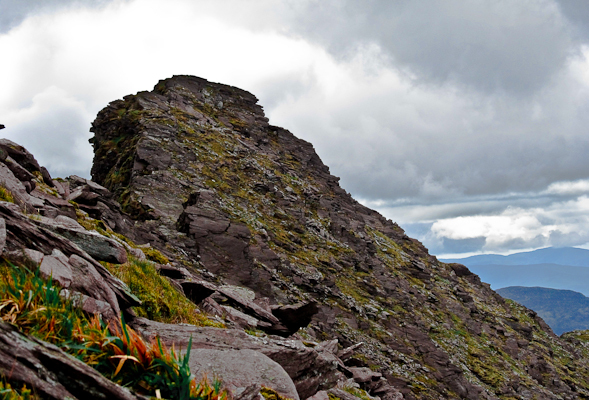 The summit of Cruach Mhor is marked by a large grotto with a brass statue of the Virgin and Child. From Cruach Mhor though it looks daunting start by following the ridge crest then following the faint track down and along under the northside of the ridge by-passing the first 2 rock outcrops. Where the path divides to an upper and lower track take take the lower one. Start to ascend at V84039 84575 C where the track to the col with Knocknapeasta is steep but obvious. From this col the ascent to the summit of the Big Gun is a matter of heading back along the crest of the ridge and not nearly as difficult as a direct assault from the east. I started at 6.30am from the parking lot on the west side of the Gaddagh River (i.e. 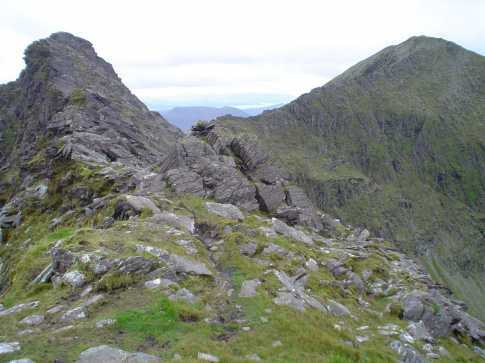 the parking area due west of Cronin's yard, typically used for the Shea's Gulley route to climb Carrauntoohil). 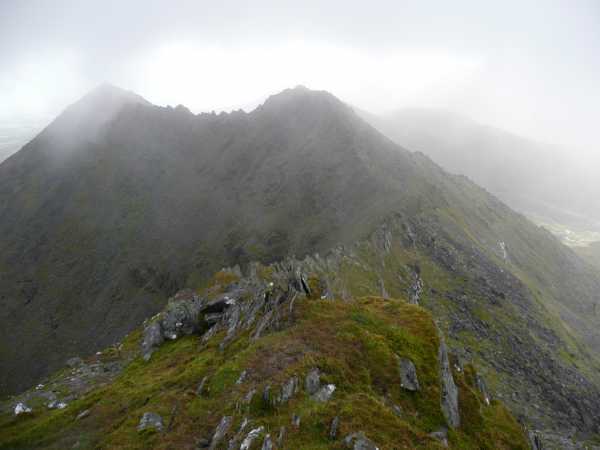 From there, I followed the path to Lough Callee, and from there headed in a south easterly direction, ascending the Bone to the summit of Maolan Bui. This part was the most physically demanding part of the trip, as it's a pretty continuous climb, and I had not picked up the trail, so it was a mix of walking on a grassy slope and scrambling on rocks. 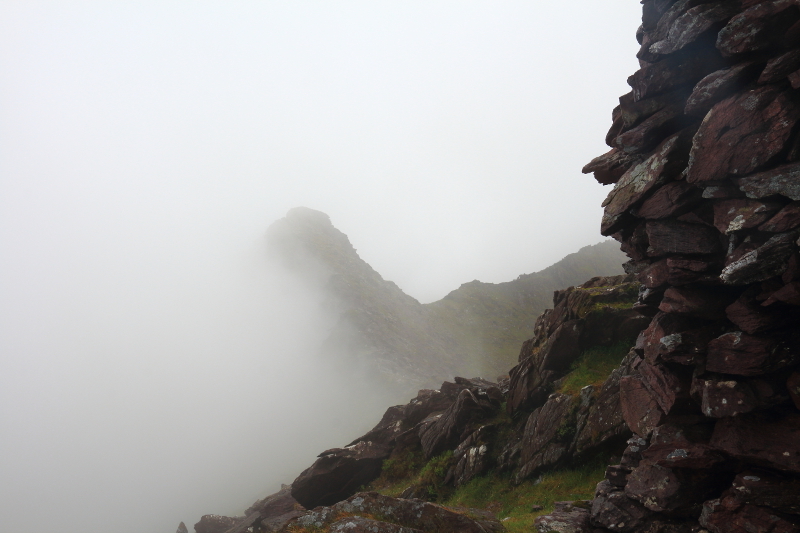 The ridge from Maolan Bui to Knocknapeasta is a pretty straightforward walk, but things get a lot more interesting from there. 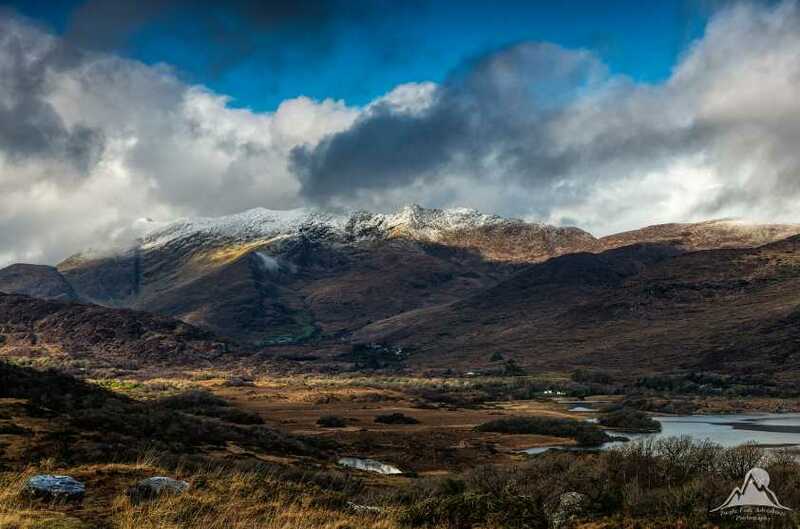 From Knocknapeasta to the Big gun, the ridge is nothing short of spectacular. The views are fantastic, and the exposure on both sides will certainly test your head for heights. The only exposure that I have experienced in Ireland that comes close is on a short section of Sliabh League in Donegal. I stayed on the skyline as much as possible, which meant a few interesting downclimbs to deal with. The ascent up the southern slope to the top of the Big Gun is fairly straightforward, and from there had a short steep descent to the ridge heading over towards Cruach Mor. This ridge does not have as much exposure as the section between Knocknapeasta and Big Gun, as it is a broader ridge, with a flatter top, however if you stick to the skyline, it is more interesting (and challenging) due to 3-4 sections where you have to downclimb approx 10 ft drops - does not sound like much, but a fall could mean you tumble a long way before stopping! After the summit of Cruach Mor, there is a long slog back to the starting point. Descending the ridge in a northeasterly direction from Cruach Mor, a fence marks the spot where you turn north, and begin the descent back towards home. When you reach the point where this slope starts to flatten out, turn north west for a squishy walk (or run!) through bog to the point where the Cronin's yard trail crosses the Gaddagh river. From there, cross the river, and pick up the trail that brings you back to the parking lot. This was a great loop to do on an early weekday morning. I was the only person up there, and got back to my car by 10.15am, just in time to make breakfast (barely!) back at the B&B in Beaufort. 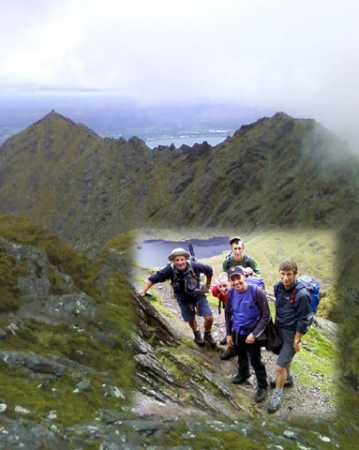 Picture from Bleck Cra : A RIDGE TOO FAR? Picture: A RIDGE TOO FAR?